Multi-award winning British singer, Craig David, has today surprised unsuspecting fans with a special live performance streamed with BT Mobile in Central London. 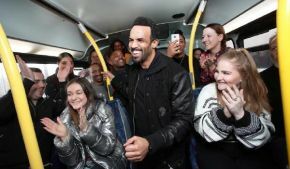 The ‘I Know You’ singer was spotted belting out his new single Magic and classic hit 7 Days on a London bus, delivering an entertaining performance to passengers. The surprise gig was live streamed by BT Mobile to the star’s 769,000 Facebook followers, allowing fans at home to be part of the action in real-time and demonstrate the reliability of the BT Mobile network. Craig David, said: “Connecting with my fans, no matter where they are, is what it’s about. Performing to such an intimate crowd as well as livestreaming the gig with BT Mobile meant fans all over the world joined us in that special moment. All joining SIM customers continue to have 30 days to make sure they’re happy with BT, and if they want to leave within that time they’re guaranteed to get their money back on everything included in their plan. For more information on BT Mobile visit: www.bt.com/mobile.